I was discussing yesterday [12 November 2018] how the water buses in Venice offer the most affordable and easiest way to view the palaces that line the Grand Hotel. In the morning, I introduced four palaces: the Palazzo Bembo, the Palazzo Santa Sofia also known as Ca’ d’Oro, the Palazzo Cavalli-Franchetti and the Ca Rezzonico. 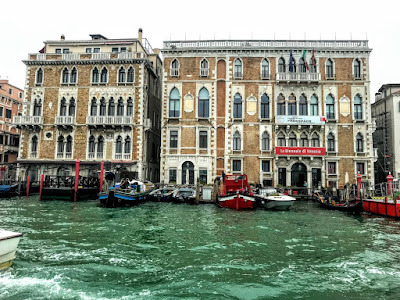 In the afternoon I looked at four more palaces on the Grand Canal: the Palazzo Contarini Fasan, the Palazzo Capello Malipiero, the Palazzo Cavalli or Palazzo Corner Martinengo Ravà and the Palazzo Corner Spinelli. This morning I want to introduce the architecture and stories of six more interesting palaces on the Grand Canal: the Palazzo Barozzi Emo Treves de Bonfili, home to adventurers, patriarchs and bankers; the Palazzo Loredan dell’Ambasciatore, once the home of ambassadors and now an apartment hotel; the Ca’ Giustinian or Palazzo Giustinian Morosini, a 15th century Gothic palazzo, is now the Venice Biennale offices; and the Casa Santomaso, the Palazzo Orio Semitecolo Benzon and the Palazzo Salviati, which form an interesting group of three smaller palaces. The Palazzo Treves de Bonfili, sometimes also known as Palazzo Barozzi Emo Treves de Bonfili, overlooks the Grand Canal at a point where the canal and the Rio di San Moisè meet, opposite the Punta della Dogana. It stands out on the Grand Canal because of its characteristic pink colour. The palace stood at a strategic position for maritime trade. The narrow Rio di San Moisè provides quickly access to Rialto as it soon turns into Rio San Luca to flow near Palazzo Grimani. The Barozzi family had built a crenellated palace here by the early 12th century, and it was enriched with a loggia, a portico and two large square towers. The Barozzi were an aristocratic Venetian family. Pietro Barozzi led a Venetian naval expedition against Pisa in 1192. His brother Andrea Barozzi sailed with the Venetian force led by the Doge, Enrico Dandolo, in the Fourth Crusade. After the sack of Constantinople in 1204, Iacopo Barozzi seized the islands of Santorini and Thirassia, and Benedetto, Marino and Pancrazio Barozzi obtained military fiefdoms in the Venetian colony on Crete. Angelo Barozzi was Patriarch of Grado (1207-1237), Giovanni Barozzi was Bishop of Bergamo (1449-1465) and Patriarch of Venice (1465-1466), and Pietro Barozzi was Bishop of Belluno (1471-1487) and of Padua (1487-1507). Elena Barozzi, a famous beauty painted by Titian and Vasari, was the mistress of Lorenzino de' Medici. 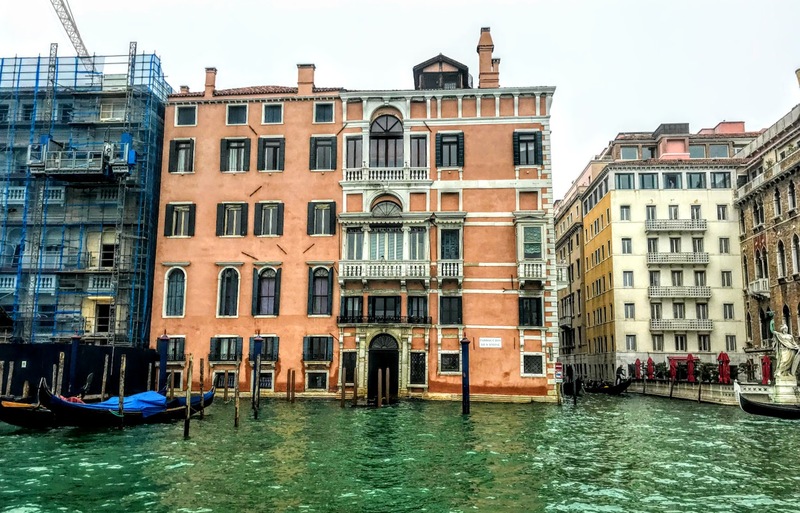 During restorations in the 17th century, the architect Bartolomeo Manopola decided to make the side of the palazzo facing the Rio di San Moisè the main façade rather than the side facing the Grand Canal, which is asymmetrical. 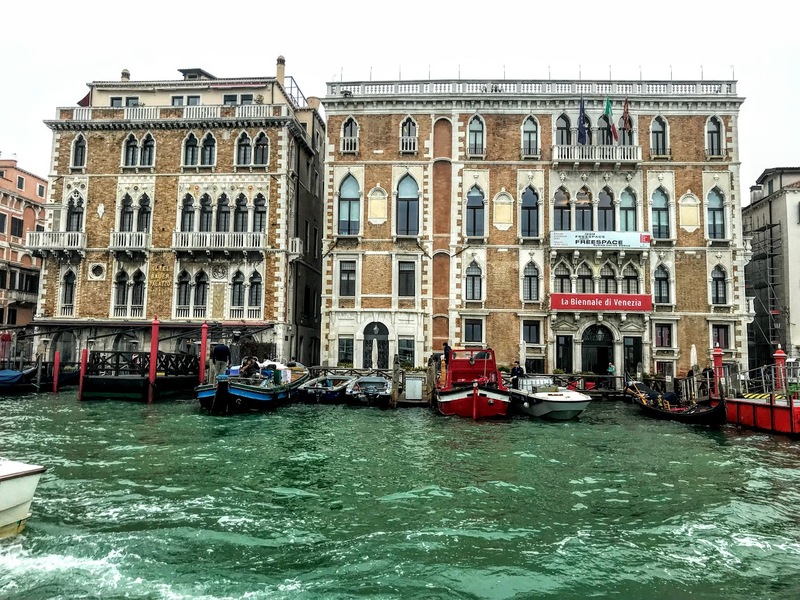 The façade facing the Grand Canal is clearly divided into two sectors: the left and more plain side survives from the original building; the right side, distinguished by two impressive serlianas and a magnificent water portal, is a fine example of Renaissance architecture. The façade facing onto the Rio di San Moisè is much larger. Its heights and its length have been developed so that appears disproportionate to the space it faces. Each floor has 15 windows, often arranged in pairs, and the axis of symmetry is in the monumental portal. Some of the many openings have been made blind. The building has a belvedere on the roof. Generally, the building is attributed to Bortolo Manopola, but it was remodelled by a Greek builder, Michele Sumachi or Soummakis. It is based partially on the Ca’ Grande dei Barozzi, one of the most important pre-Gothic palaces in Venice. The earlier building underwent extensive renovations in the 18th century, but these were interrupted with the transfer of ownership to the Emo family. In 1827, the palazzo was bought by the Treves family, a Jewish banking family with the title of baroni de Bonfili. The Treves family transformed the internal rooms, without altering the unfinished façade, and the building became one of the best examples of neoclassicism in Venice. The building on the left of the palace was also built in the 19th century by the Treves family. Jacopo Treves introduced works by Angelo Pizzi, Giuseppe Borsato, Giovanni Demin, Sebastiano Santi, Francesco Hayez, Michelangelo Grigoletti, Antonio Bosa and others. Two statues by Antonio Canova, Ettore and Aiace, were placed in a special apse compartment overlooking the water. The Palazzo Loredan dell’Ambasciatore is a late 15th-century Gothic palace that once belonged to the noble Loredan family, and was birthplace of two doges. It is called dell’ambasciatore because it was once the residence of the ambassadors of the Austrian Empire to the Serene Republic. The notable features of the building include the quadirfora on the first floor, with a loggia fronted by balustrades and columns, and two statues of pages flank the loggia. Antonio Loredan was the Venetian administrator of Corfu who defeated the Turks in 1716 alongside Count Johann Matthias von der Schulenburg, a Saxon general. After the battle, the German count set up house inside the Loredan Palace, along with 25 members of his entourage and four gondoliers. Vivaldi wrote an opera in Schulenburg’s honour, but most of all he was known for his lavish dinner parties and his extensive art collection. Francesco Loredan, who later became the Doge of Venice, offered the palazzo as a residence for the Ambassador of the Holy Roman Empire in 1752 in exchange for 29 years of restoration works. The first Imperial ambassador to live there was Count Philip Joseph Orsini-Rosenberg. Shortly after his arrival in Venice, he married Giustiniana Wynne, a close friend of Giacomo Casanova. The couple lived together in the palazzo during the first years of their marriage. Today, the Palazzo Loredan dell’Ambasciatore is owned by the Gaggia family, and is an apartment hotel, divided into five apartments sleeping up to 40. The apartments, available to rent, the apartments range from contemporary three-bedroom units to lavish seven-bedroom units, with kitchens, living rooms, dining rooms, and furnished balconies with canal views. 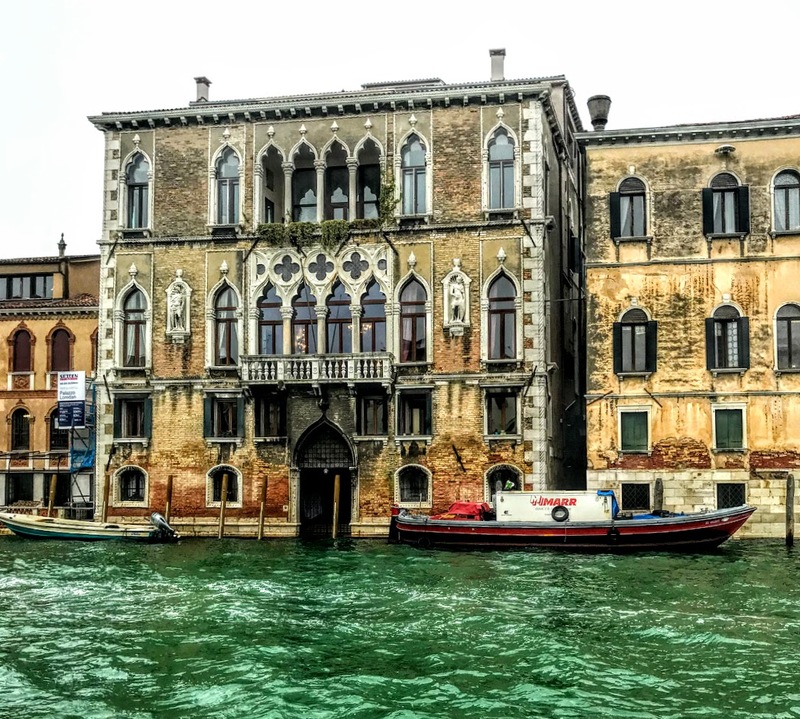 The Ca’ Giustinian or Palazzo Giustinian Morosini, is a 15th century palazzo on the Grand Canal. It was commissioned by the Giustiniani family, a Venetian patrician family, in the second half of the 15th century. It replaced an earlier palazzo where Lorenzo Giustinian, the first Patriarch of Venice, had lived earlier that century. The great facade of the palazzo consists of four floors divided by string courses. The main part of the building was connected through the filling of a street in the late 15th century to a building on its left. Since then, the two buildings have been one. The palazzo passed in the 17th century to the Morosini family, a family that gave many doges, statesmen, generals and admirals to the Venetian Republic and cardinals and Patriarchs of Venice to the Church. The doge Francesco Morosini (1618–1694) who gave the family name to the Morosini Fountain in Lion Square in the centre of Iraklion in Crete. The Morosini family continued to live in the palazzo until 1820, when it was transformed into the Europa hotel. Those who lived or stayed here include Théophile Gautier, Marcel Proust and Giuseppe Verdi. The palazzo was bought by the municipality and restored, and it now houses the offices of the Venice Biennale. The Hotel Bauer Palazzo next door is a Gothic Revival hotel built in the 19th century. The Palazzo Salviati on the Grand Canal, between the Palazzo Barbaro Wolkoff and the Palazzo Orio Semitecolo, was built as a shop and the furnace of the Salviati family in 1903-1906, and was designed by the architect Giacomo Dell’Olivo. The company was founded by Antonio Salviati in 1859. The building underwent a major renovation in 1924, with the addition of an extra floor and the placement of large mosaics on the façade. Structurally, the façade is relatively simple, with arched doors on the first and third floors and matching arched windows on the second floor. The mosaic figures that cover most of the façade include a large mosaic in the centre of the building and smaller mosaics over the doors on the first floor and at the top of the third. To the left, the Palazzo Orio Semitecolo Benzon was built by the Orio family and was owned by the Benzoni family by the 14th or 15th century. It was integrated with the Palazzo Salviati in the 20th century. The Gothic façade has a different style on each floor: the first floor is in typical 14th century style, the second is in 15th century, while the top floor was added in the 19th century. To the left again, the Casa Santomaso stands between the Palazzo Orio Semitecolo Benzon and the Palazzetto Nani Mocenigo, close to the Basilica of Santa Maria della Salute. This is a typical 15th-century building, with Gothic and Renaissance forms.